The U.S. bank prime rate continues to be held steady at 3.25 percent. While there have not been widespread changes, credit card offers are proving more variable in the fall than they were over the summer. In early November there was one change in the offers tracked by this survey, causing a slight rise in the average for the consumer rewards category. This change caused a slight widening in the rate spread based on credit ratings, but if recent economic trends continue, that spread could narrow once again. Two positive economic reports set the tone for early November's economic environment. First, on Oct. 30 the Bureau of Economic Analysis released its advance estimate of third-quarter Gross National Product. While this estimate's real growth rate of 3.5 percent represented a slowing from the second quarter's robust 4.6 percent rate, some of that second-quarter growth was due to pent-up demand after a brutal-weather winter. A 3.5-percent rate would mean the economy remained solidly on track. This impression was reinforced by the employment report from the Bureau of Labor Statistics on Nov. 7. This showed job growth at 214,000 for October, marking the nine consecutive month with job growth over 200,000. As economic conditions improve, consumers find it easier to repair their credit histories, and credit card companies are more confident about lending to people with less-than-perfect histories. So, while some interest rates might be rising as the economy picks up momentum, people with marks on their credit reports might actually see their credit card rates start to improve. 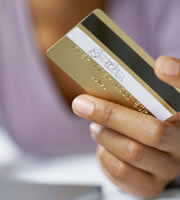 The average rate for consumer rewards credit cards rose by four basis points, to 17.91 percent. This raised the overall average consumer credit card rate to 17.20 percent, and widened the gap between the average rewards and non-rewards rate to 2.35 percent. That gap represents the potential cost of rewards programs, but the widening of this gap in the latest survey should not be viewed as especially significant. 2.35 is where this spread spent most of the summer, and it has been both a little higher and a little lower than that in recent weeks. The rise in the average consumer rewards credit card rate was the result of an increase in an mid-level rate tier by a single credit card. In short, the increase is hardly indicative of an industry-wide trend, but it does carry two important messages for consumers about shopping for credit card rates. First, credit cards do not all raise and lower rates at the same time, so shopping around when choosing a credit card and periodically revisiting the market can save consumers money. Second, since the change in question affected only one in three rate tiers offered by that credit card, it illustrates the importance of comparing rate offers specific to the consumer's credit standing. Student credit cards continued a long run of consistency, with all offers in this category having remained unchanged since February. Rate offers on both business non-rewards and rewards credit cards were unchanged in the first half of November. The change in one of the higher rate tiers for consumer credit cards meant that the spread between the overall average rate offered and the average rate for customers with excellent credit widened by three basis points, to 4.03 percent. This means their is potentially a slightly higher price to be paid for maintaining less-than-perfect credit. 0 Responses to "Credit card rates on the move again"